Tour Ends: Old Town Square. Of all our Prague tours, the Prague Grand City Sightseeing Tour is the most popular, a superb introduction to this city of rich, opulent beauty with an epic history. This sightseeing tour is part by air-conditioned coach, part on foot (some of the city's finest areas are only accessible on foot). After picking you up from your Prague hotel, we embark on a fascinating journey through time to learn of the people who have shaped the city, and to discover the places they built over the past 1000 years - Prague has over 4,000 monuments. We begin the tour on the coach, introducing the major historical areas of Prague: the New Town with Wenceslas Square at its heart, the charming Old Town and the picturesque Lesser Town. Next, we drive up to the castle for the highlight of the trip: a 75 minute walk through the Prague Castle complex to discover the major sights within. Our guide will find the shortest security queue into the castle. On the tour the guide brings the magnificent castle buildings to life, explaining their turbulent history, and their royal and presidential connections. We admire the grandeur of Saint Vitus Cathedral, the ancient architecture of the Old Royal Palace, the state apartments, the fortifications and towers, and other historic churches and national treasures. Finally, we enjoy the stunning views over the whole of Prague. From Prague Castle we walk down to the Vltava River via a flight of steps (the steps are lengthy, but wide and deep, and so fairly easy to walk down). We then stroll across the city's historic river crossing, Charles Bridge, which presents yet more wonderful panoramic views. And we continue on through the Jewish Quarter and on to explore the Old Town. As we journey around, we learn why Prague is one of the best preserved medieval cities in the world. For refreshments, there is a short break (time permitting) half way through the tour. The trip finishes at the Old Town Square. Highly recommended. Note: We also offer a version of this tour with a boat trip included: Prague Grand City Sightseeing Tour & Boat. 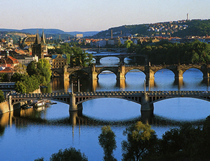 Hotel pick up + Guided tour of Prague, including a walk through Prague Castle & St. Vitus Cathedral.